Kathryn Kaye is a composer, organist and pianist. She has been classically trained but draws from her experiences in jazz, folk music from the Appalachian Mountains where she grew up and crafts music both simple and evocative. Each piece is created with feeling and always leaves me longing for more. The album was recorded at Imaginary Road Studios and was recorded and mastered by Tom Eaton. Contributing artists include Gus Sebring (French horn), Jeff Haynes (percussion), Tony Levin (Chapman stick), Tom Eaton (percussion, accordion, bass), Eugene Friesen (cello), Jill Haley (English horn), Will Ackerman (percussion), Charlie Bisharat (violin) and of course the talented fingers of Kathryn Kaye (piano). “Elk Creek in the Fall” is the second track on the album and features Gus Sebring (French horn), Jeff Haynes (percussion), Tony Levin (Chapman stick), Tom Eaton (percussion), Kathryn Kaye (piano) and Eugene Friesen (cello). Effervescent, this piece is a tapestry wound together to seamlessly create a vision of backwoods Kentucky and the glorious forests that grace the land. Sweeping piano sequences are paired with the cello, horn, percussive elements and the Chapman evoking a lush composition of harmony and light. “Willow Waltz” is a tender piece that urges me to close my eyes and walk through the lit path into the forest, surrounded by the majesty of color and the changing seasons. No matter the day, the crisp scent of autumn burns down the back of your throat and the smoky ghost of burning leaves fills the air. It is a time of change. The willow trees are a bountiful and grace filled oasis inside the woods. They bend and sweep, whilst other trees reach for the sky, determined to shed their seasonal colors in a riot of burnt orange and flame yellow. The willows dance under the sky and your fingers intertwine with the long and sinewy branches. Pieces and artists heard on this track include Kathryn Kaye (piano), Jill Haley (English horn), Tony Levin (Chapman stick) and the legendary Will Ackerman on percussion. “Patterns of Sun and Shade” is the title track to the album. When you look into the trees and squint your eyes, what do you see? Little patterns of light and dark-the shady places and the kiss of sunshine beaming through the leaves. That is the essence of this piece. Light peeks through finely veined leaves illustrated by the skillful playing of Gus Sebring (French horn), Jill Haley (English horn), Tom Eaton (bass) and Kathryn Kaye (piano). 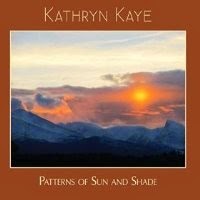 Since the first time I heard Kathryn Kaye’s work, I fell in love with her vision of nature via sound and substance. Well placed fingers on the keyboard, combined with a love of the natural world and her home in the woods of Kentucky show just like the dappled light through a bevy of leaves. The fellow artists she chooses are her branches and the tree is firmly planted in the ground. This album was soothing and hasn’t stopped playing since I received it and won’t be any time soon.